Our invitations are made by hand and are all printed in our own workshop. 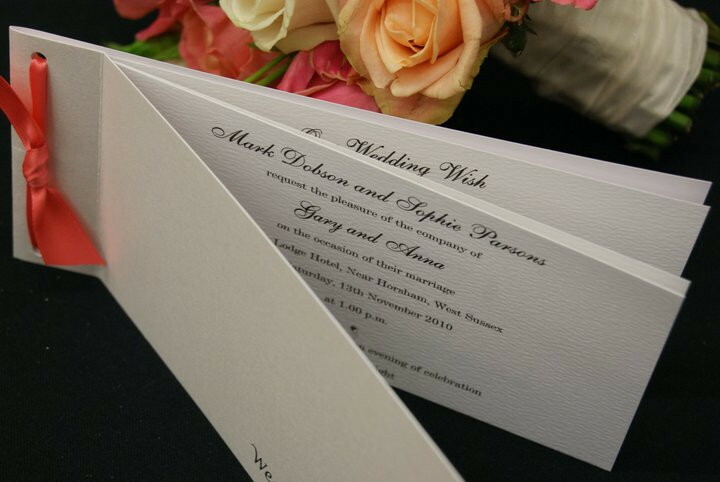 We do not offer “ranges” of stationery, we work closely with each couple to ensure the invitations they send reflect their big day perfectly; they are made bespoke for you. 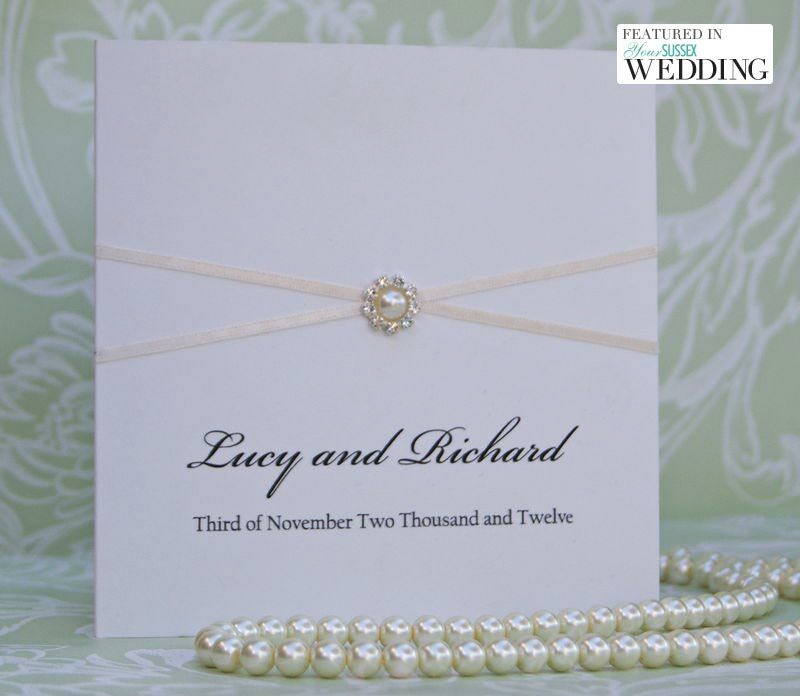 Our invites are available in an array of styles and card colours and we have 100’s of ribbon colours and finishes to choose from. 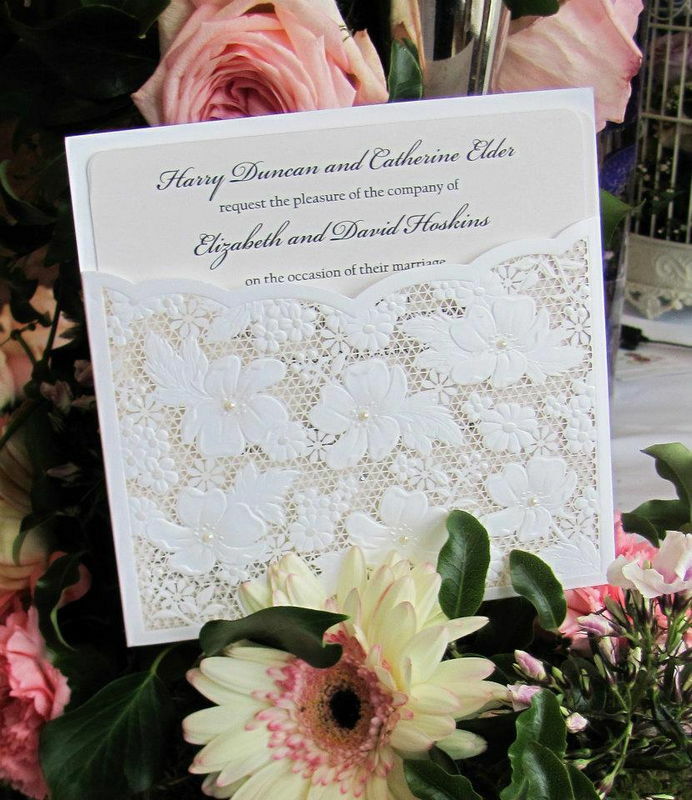 We use the finest raw materials which include beautiful boards and papers, satin ribbon, Swarovski crystals/pearls and grade A crystal embellishments. We can make them as elaborate or as plain as you like…. All our invitations are tissue wrapped before placing in the envelope (don’t worry we will tell you who’s invite is in each envelope). 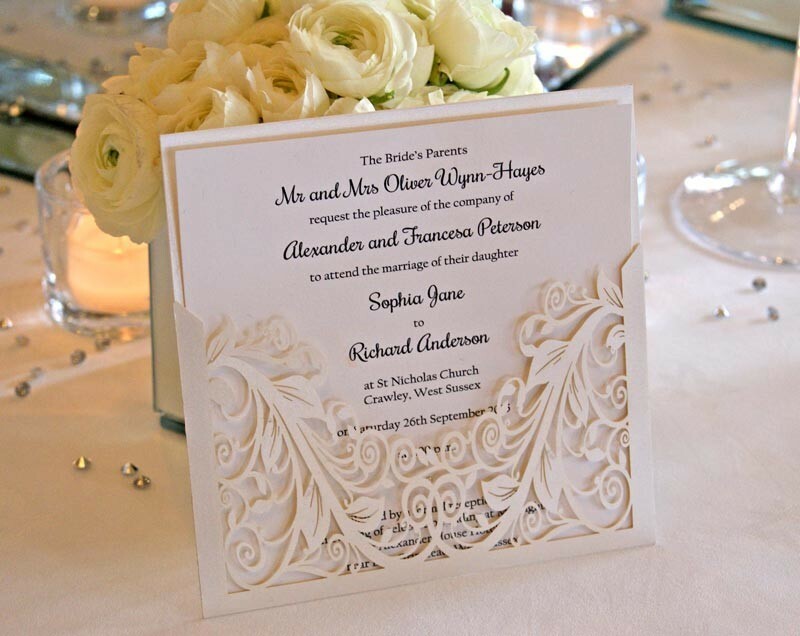 If you require, we can individually print names inside each invitation; there is a charge of £20.00 one off fee per set of invites (irrelevant of how many you need). Day invites are classed as one set and evening invites are classed as another set. 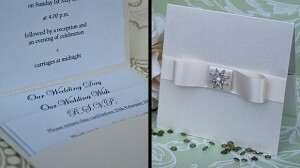 Invitations shown here are copies of work we have made for previous couples and are a small selection of designs. All stationery can be re-created or changed (i.e. ribbon colour, embellishment and font) to reflect your very special day or we design something that is perfect for you. Make sure you co-ordinate your wedding day with our “On The Day” stationery, favours and finishing touches. 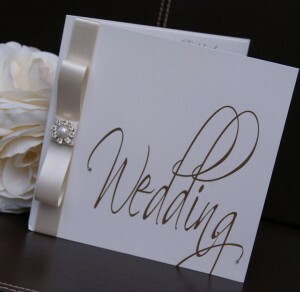 This is classic opening card with print front (shown here in ivory) but can be printed on a huge array of coloured card. The "D" can be finished with a Swarovski crystal or Swarovski Pearl. A classic opening card with ribbon kiss and detailed with a small embellishment. Available in any ribbon colour and small embellishment. Price also includes one information card. 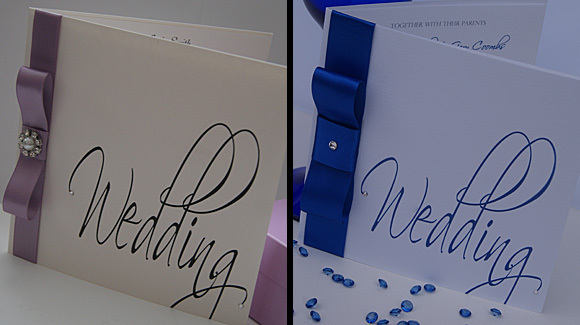 This is a pocketfold invitation; apart from the main invitation; all the guest information, wedding gift and rsvp card/printed envelope is placed neatly inside the pocket. 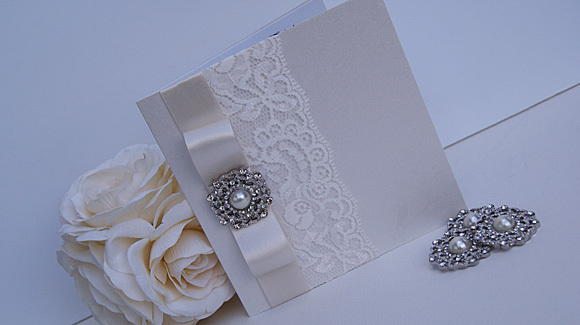 This card is available in an array of colours and the ribbon and embellishment can be changed to suit your theme. The price includes all inserts, there are no hidden costs ! This invitation is an ivory pearl two fold card. The front is finished with an ivory lace wrap to the side and an overlay of pearl ivory satin ribbon. This is detailed with a formal bow and a vintage inspired pearl and crystal embellishment. Please remember we make bespoke invitations, so this invitation is available in a huge array of colours, ribbons and embellishments. 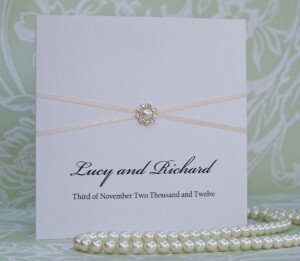 This invitation is an ivory pearl two fold card. The front is finished with an ivory lace wrap and an overlay of pearl ivory satin ribbon. This is detailed with a formal bow and a vintage inspired pearl and crystal embellishment. Price includes information card too. Please remember we make bespoke invitations, so this invitation is available in a huge array of colours, ribbons and embellishments. This classic opening card is printed (by us) with a fabulous floral vintage "Cath Kidson" inspired print. This print can be adapted to work on all other stationery pieces. We show it here with a vintage font too but this can be changed. Wording can be adapted on the cover to meet your requirements. 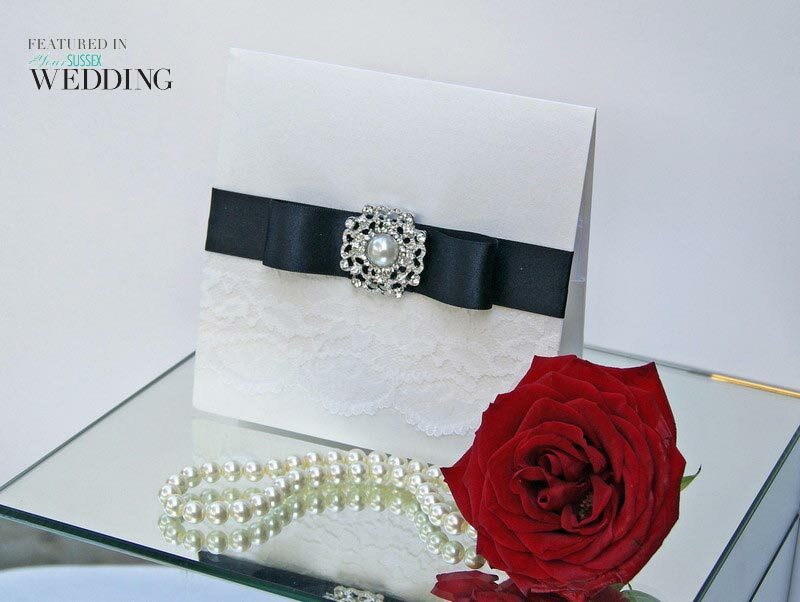 This invitation is a pearl ivory pocket fold and is finished with a pearl ivory ribbon wrap detailed with a formal bow and a large vintage inspired AB crystal embellishment. These are called pocket fold because each invitation has a little pocket which contains all the relevant information for your Wedding or Civil Partnership - including venue details, accommodation details, gift list and an R.S.V.P card and pre-printed addressed envelope. The price includes all inserts, there are no hidden costs ! One of the most popular designs. This is a classic card with large swirly font. A ribbon wrap down the left hand side is finished with a bow and a small embellishment. 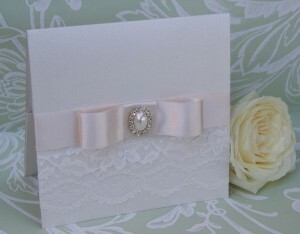 Here shown on sparkly ivory card, ivory ribbon and pearls. Price includes an information card too. This is classic opening card with print front. 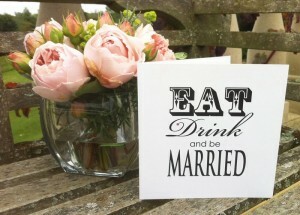 Shown here printed on the popular vintage brown card but can be printed on a huge array of coloured card. The "D" can be finished with a Swarovski crystal or Swarovski Pearl if required but shown here plain. 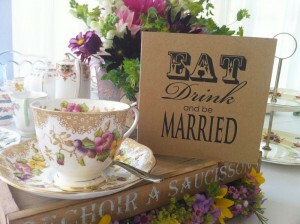 Fabulous vintage wedding invitation. 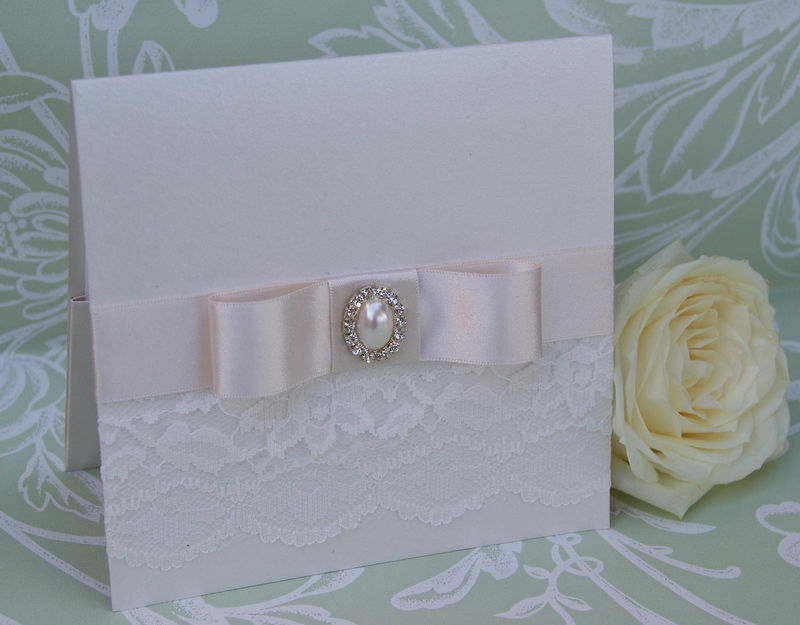 Chiffon is a lovely way to soften a card and is available in lots of colours. 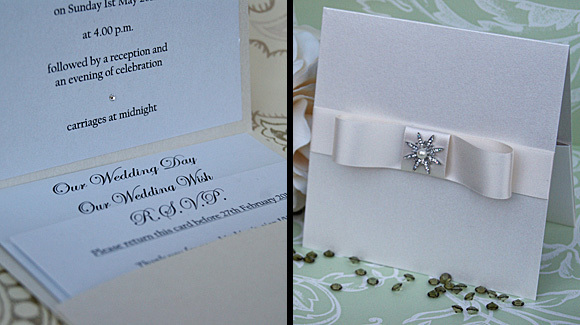 This invitation is an ice silver (white with crystal embedded into it for a silver sheen) pocket fold. This has been finished with a white chiffon wrap with an overlay of white satin ribbon, detailed with a formal bow and a gorgeous AB crystal vintage inspired embellishment. As per all our pocketfold invitations the price includes the main invite plus information card, gift list info and a RSVP card/addressed envelope within the price. 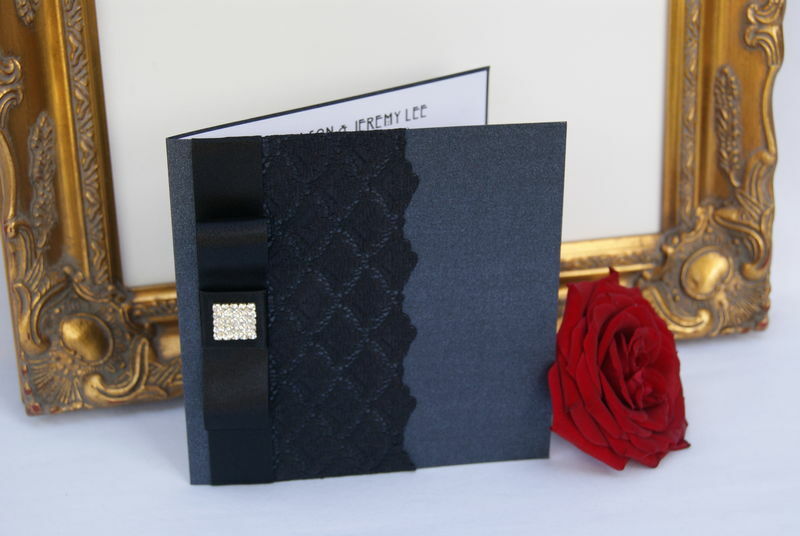 An all black invite with iridescent black card, wide black lace and a wide ribbon with bow and crystal square embellishment. Rather than a paper insert this has rigid flat cards secured to either side, so the black is showing as a frame inside. 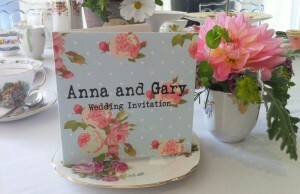 These are fabulous for couples wishing to include lots of information. The invite is the same as a cheque book and even the inserts have perforations. 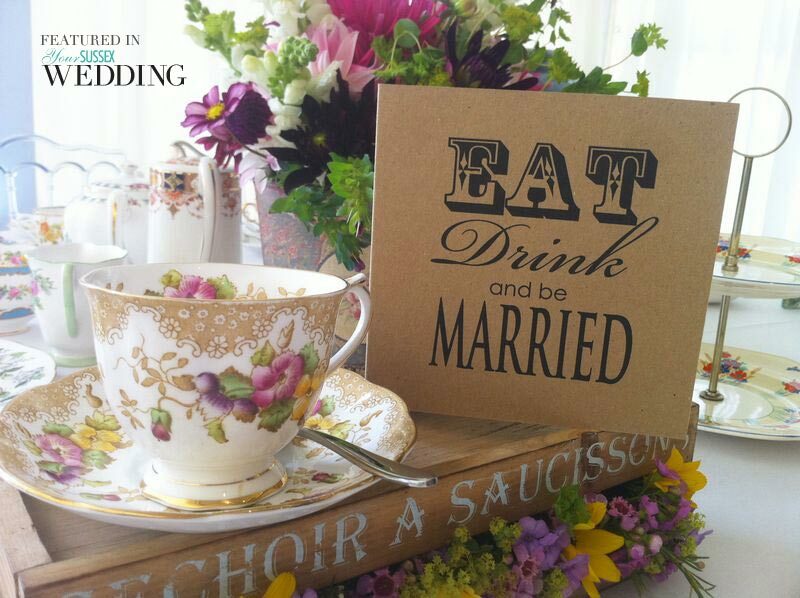 Each page is filled with wedding information and an RSVP slip is easy as your guest(s) fill the form in, detach it and send it back to you ! The book is tied with ribbon of your choice (and can be detailed with tiny Swarovski crystal at a surcharge of £0.25). 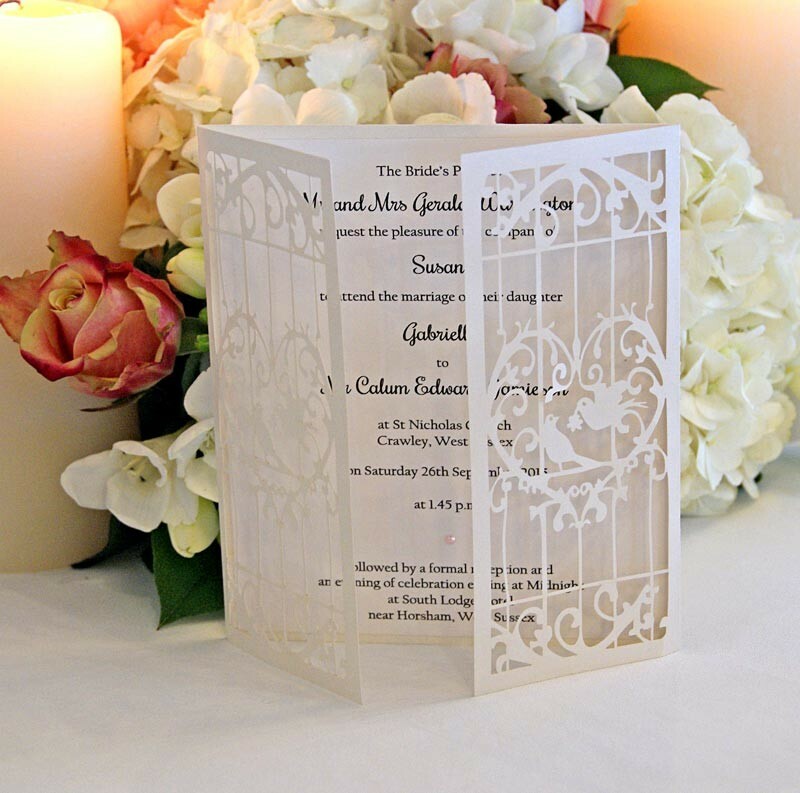 These are available in Pure white, Soft Ivory and Black and have a brocade pattern to the cover, so although a solid colour the pattern does show in light. Great value invites. Price is for up to 6 slips, printed to your requirements. This invitation is a gate fold card - it opens from the centre. 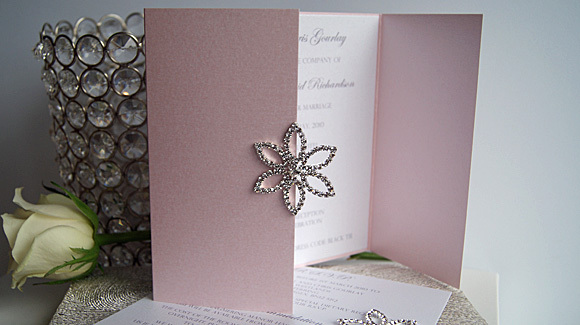 Shown here in a pale pink pearl card and detailed with a grade A crystal flower (which is very sparkly). Please remember we make bespoke invitations, so this invitation is available in a huge array of card colours to match your theme. Day and evening invites should be in keeping but not necessarily be an identical match. 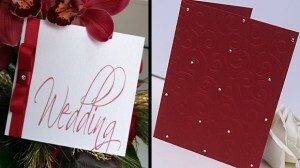 Here shows the swirly wedding card for the day guests and a red hand embossed card scattered with Swarovski crystals. One of the most popular designs. This is a classic card with large swirly font. A ribbon wrap down the left hand side is finished with a bow and a small embellishment. 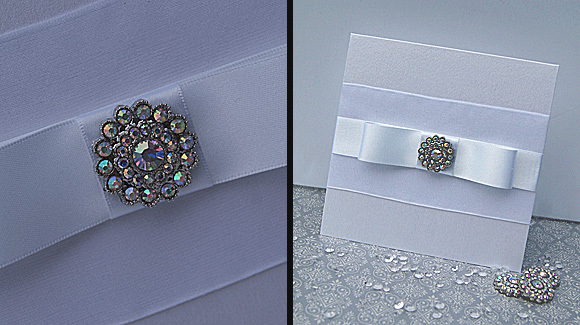 Here shown in sparkly ivory card, vintage lilac ribbon and pearl and a bright white card with royal blue ribbon and print. Price includes an information card too. 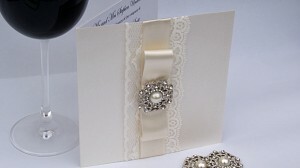 This invitation is a gate fold card - it opens from the centre. 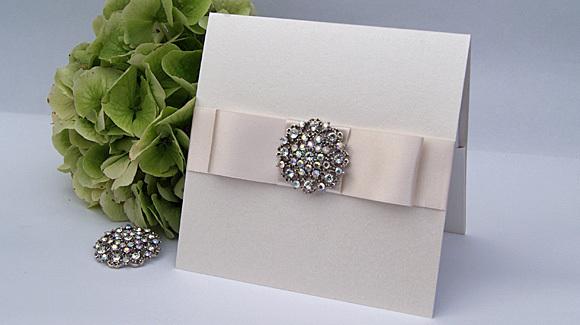 Shown here in a silver sparkle card this invitation is adorned with two lines of clear Swarovski crystals on the outside - it is seriously sparkly. Tied together with a huge colour co-ordinating ribbon, this invitation is for maximum impact for your guests and its utterly stunning presented in a matching presentation box (extra £1.15 per invite) Please remember we make bespoke invitations, so this invitation is available in a huge array of card colours to match your theme. 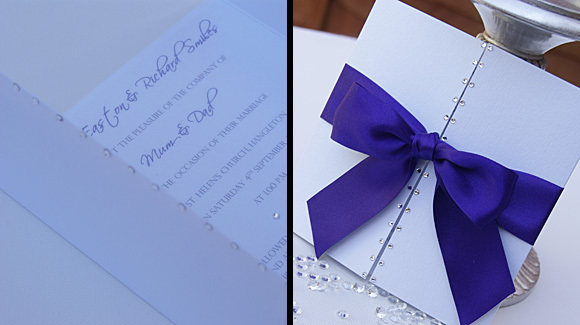 This is a pocketfold invitation; apart from the main invitation; all the guest information, wedding gift and rsvp card/printed envelope is placed neatly inside the pocket. This card is available in an array of colours and the ribbon and embellishment can be changed to suit your theme, some smaller embellishments will decrease the price. The price includes all inserts, there are no hidden costs !